Iconic West Australian and family owned bakery Mrs Mac’s is celebrating the success of its first year supplying Optus Stadium, with 600,000 units consumed in the 12 months since the state-of-the art venue officially opened in January 2018. The 60,000 seat Optus Stadium is a showpiece for Mrs Mac’s range of pies and sausage rolls and demonstrates the company’s ability to successfully operate in a large venue with intensive all year activity, including sports, major AFL finals, cricket and large international concerts that together attracted more than 2 million visitors. 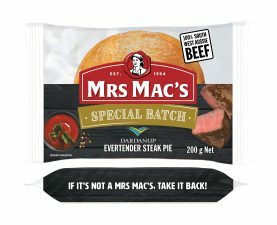 Mrs Mac’s has shown its ability to innovate and rapidly respond to customer opportunities with the creation of its Dardanup EverTender Steak Pie showcasing quality local produce and reinforcing the company’s pledge to deliver quality in every product. Mrs Mac’s also delivered a range of special offers for fans, including a focus on Western Australian products with local brewer Gage Roads. Mrs Mac’s General Manager – Sales and Marketing, Drew Fairnham said the company had clearly established its production, sales and logistics capacity to operate in the largest venues in Australia by working closely with stadium management to supply the right product range, price points and meal deals for fans. “In our initial months at Optus Stadium, we made sure we were agile and worked closely with stadium management to connect fans to delicious savoury pastry products anywhere and anytime in the venue. This was all about precise serving times, product offering and availability, and minimal wastage,” Drew said. Mrs Mac’s can be found in twenty retail locations throughout Optus Stadium including, with up to 1 in every 7 visitors at major events regularly buying and eating a Mrs Mac’s item. The outlets include the only dedicated on-site pie shop at a major Australian venue, making delicious, quality pastry products easily accessible to fans. Drew said that in addition to ensuring operational excellence in a new venue where there was no knowledge of fan behaviour and routine, Mrs Mac’s had worked hard to deliver a tailored product range for visitors. “Our success at Optus Stadium is down to our ability to deliver the best offer for fans through product bundling and creating deals such as the WA Double Header Deal with Gage Roads, celebrating being proudly West Australian,” he said. Mrs Mac’s beat east coast competitors in late 2017 for the exclusive rights to supply Optus Stadium its tasty pies and savoury pastries to fans for a five year period.